For questions or more information about any of our products and services, please email or call us at 877-843-0183. 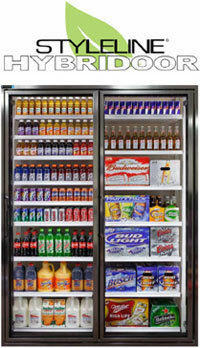 We are your convenience store design consultants! We look forward to assisting you with your Beverage Cooler. Our area of expertise is walk-in cooler design, and we distribute the leading names in the industry when it comes to Glass Display Doors! Styleline Doors are the industry leaders when cost and efficiency are your goals! 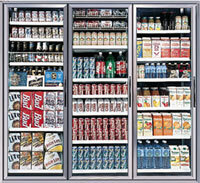 If you are planning to replace your existing beverage cooler doors or design a new walk-in cooler with matched, commercial refrigeration, we can help! 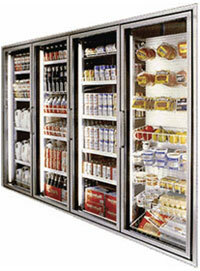 See JayComp, convenience store designers. Fully compliant with The Energy Independence and Security Act as effective January 1, 2009 for all new stores and remodel projects. Sets a new standard in protection against condensation, 75% RH, a greater than 15% improvement over the old industry standard. The advanced thermal design and strategic anti-condensate heater placement deliver enhanced condensation protection with very low energy use. In a word, it’s EFFICIENT. Two year material and workmanship warranty. Shelf standards (posts) with brackets and levelers. The STYLELINE Heavy-Duty Plus Entrance Door stands up to the highest traffic areas and provides shopper-friendly, trouble-free performance. 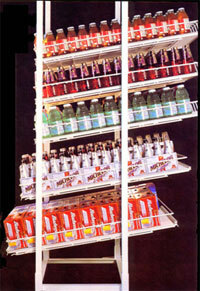 STYLELINE® Super Slide-Trac® gravity-flow shelving offers maximum flexibility for you and an inviting display for your customers.